While the Fast and Furious franchise is still very profitable, it is in a small state of semi-flux with the unfortunate passing of Paul Walker, and it just feels like there are not many more left in the tank. Additionally, since the fourth installment the films have shifted their focus from underground racing to crime films interspersed with notable car sequences. Presumably, this leaves a void in the racing market, one that the new Need for Speed, a movie adapted from the video game series, hopes to fill. Need for Speed stars Aaron Paul as Toby Marshall, owner of a small auto shop previously owned by his late father. He struggles to make payments on the upkeep and what not, so from time to time, he and his crew participate in street races. The occasional grand here and grand there works from time to time, but in order to stave off the bank, they are going to need more. 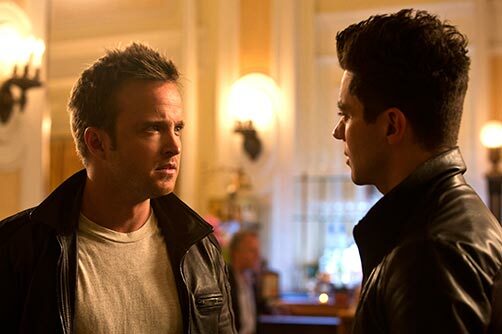 One day after a race, Toby’s longtime and now wildly successful rival Dino Brewster (Dominic Cooper) comes with a proposition: He needs a Ford Mustang rebuilt, as he is planning to sell to sell the ride for two million, and offers a fourth of the potential profit to Toby. The car sells, looks, and runs well, but some slights occur and Dino challenges Toby to a race to once and for all prove who is the best racer. Something unfortunate happens, and Toby has to take the fall by doing a two-year bid in prison. Now two years later and hell-bent on revenge against Dino, Toby makes plans to get into the De Leon, a winner-take-all street race extravaganza where Dino will most certainly be entered in. Justice and redemption will be found, that is if Toby can make it cross-country from New York to California first. If you are hoping that Need for Speed bucks tradition and stakes its claim as a solid video game film you may want to place your hopes in something else. This is not an awful film, but it is a lot closer to bad than good. I have never played the games, but really, the only connection it shares to the game franchise is the name. If someone did not know what NFS was, or know what Electronic Arts was (EA, a game publisher and developer, flashes for a few seconds before the movie starts), or know what game the characters were playing during one scene, it is entirely possible that a person could go through this movie without realizing this film is loosely based on a video game. The real similarity that NFS shares with its video game brethren is the complete lack of an engaging plot. In preparation for this movie, I did take a look at Wikipedia and read most of the plot synopses for the games. As expected, none of them sounded intriguing. Then again, it is a racing simulator, and who plays racing sims for their resonating plots? A plot is of greater importance to a movie though, and here, NFS never really gets into the first turn. I was not expecting an Oscar worthy script going in, but something akin to the first The Fast and the Furious was not too far-fetched to desire. Instead, we get an unfocused and pretty questionable direction that is lauded with plot holes and inconsistencies. It is alluded to that Toby and Dino have had run-ins in the past, but why? Is getting to this race and winning really the best way to solve the pent up revenge? Is it really worth it to venture cross country and deal with law enforcement after just getting out of prison? Simply put, the plot is pretty pitiful. 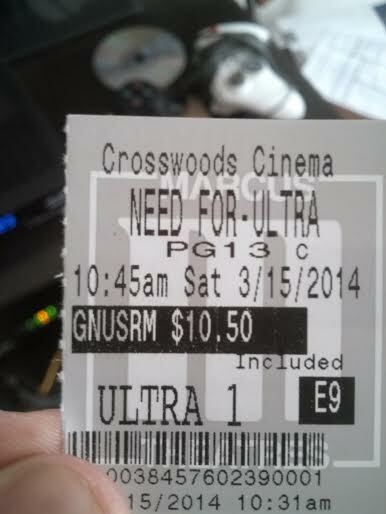 It is not helped by the 130 minute runtime either. Roughly 35 minutes pass before something of importance happens. You read that correctly. Much of the beginning could have been removed or at least melded/shortened. The first race scene is probably needed, but there is a time-wasting plot strand involving an ex-girlfriend that is clearly meant to invoke some emotion but left me bored. Speaking of emotion, I think the movie aims to be more “grand” than it really is, and this is somewhat evident by the background music. A lot of it seems like it belongs in a superhero movie, so when it is heard here, it felt out of place. The movie is not a complete failure though, and at times I really was entertained. The car scenes are filmed and dare I say shot with amazing expertise. I got the feeling I was really behind the wheel more times than not. 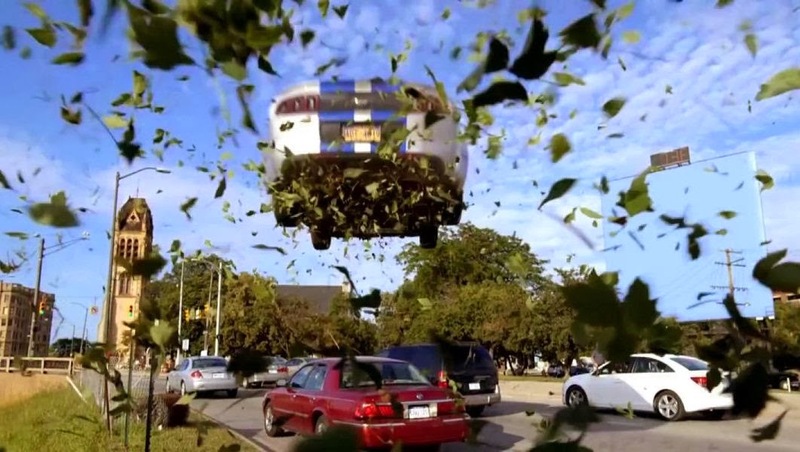 Hardly no CGI is used, and the director has gone on record saying that he required his cast to partake in driving lessons, and those stunts not performed by actors were done by stuntmen and stunt women. Aaron Paul of Breaking Bad fame does quite well with what he is given. He is gritty and believable enough in this role. Not fully convinced he is a full leading man but he deserves another shot. He also possesses solid enough on-screen chemistry with Imogen Poots, who serves as the predictable love interest. Dominic Cooper is not particularly memorable due to the writing but he does an admirable job. Aside from these people however, everyone else is forgettable. Scott Mescudi, better known as music performer Kid Cudi, is cringe-worthy, and it is not due to his acting. For a rapper starting to branch out in acting, I have seen him before do better things with roles, so he does have the capability in my opinion. Problem is, he is saddled with horrendous dialogue. The movie calls for him to be the comic relief, but I am sure I only laughed once. The humor as a whole is an ongoing problem that never rectifies itself. Unfortunately, a couple of positives do not outweigh the negatives. For a video game associated film, Need for Speed is not the bottom of the barrel. But the more I think about it, NFS is not a true video game film, it is just a below average regular film that runs out of gas in most places. We’ll see if I like it more than you. You may. Like I said the race scenes are really well done, and if I had it in the background while doing something else, I would be OK with it. As a whole though, pretty flawed. But could have been worse. I’m a Kid Cudi fan so that disappoints me to no end reading about his lackluster dialogue. Love the guy enough to be the only music concert I find myself at whenever he comes to Canada. Copper does a good job? Not that he is a bad actor but something about him bugs me. I cannot pinpoint what it is. Maybe it could be because I’ve never seen him in a role that I enjoyed. Not his fault on what he had to say. Sad, because he in my opinion does have screen presence and a natural charisma. I’ve never really seen Cooper in many things so I don’t have a working knowledge on how good he is. But here his performance wasn’t egregious or anything, it was enough. If you do gain interest in seeing any of Cooper’s films, ignore Reasonable Doubt at all costs. It may also star Samuel L. Jackson and be a 2014 release, but it is piss poor. Will do. Thanks for the avoid memo!